The heroes of the Marvel Universe are about to come together, and this time it’s being taken quite literally. 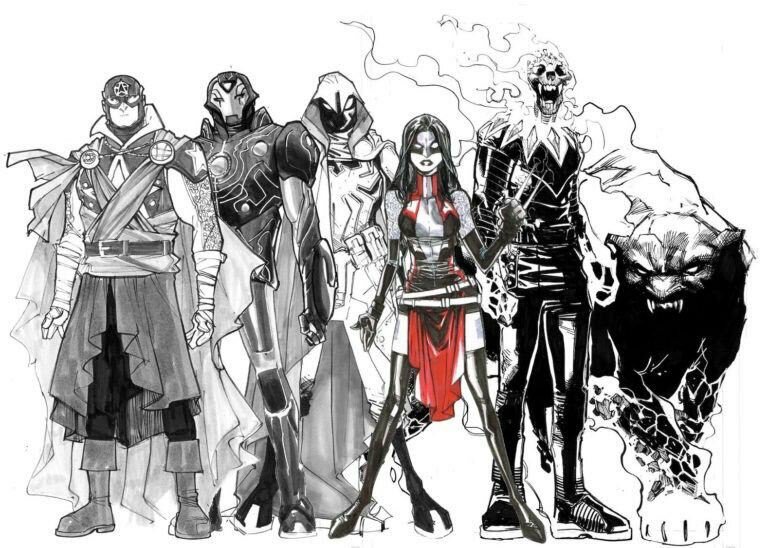 Artist Humberto Ramos, who has drawn for previous Marvel books such as Champions and Superior Spider-Man, has sketched out mash-ups of several big Marvel heroes, with the Twitter hashtag #WhoGetsWarped? above each character. Joining Ramos in the teasing so far has been Marvel Editor-in-Chief C.B. Cebulski and writers Gerry Duggan, Al Ewing and Ben Blacker. Thus far, there have been only five “warped” heroes revealed: Soldier Supreme, Weapon Hex, Ghost Panther, Arachknight and Iron Hammer. Soldier’s a fusion of Captain America and Doctor Strange; Ghost Panther is self evident, made up of a Ghost Rider and Black Panther; Hex is the X-23 and Scarlet Witch combination; Spider-Man and Moon Knight have been fused together to form the Arachknight; and Hammer is made up of Iron Man and Thor. The reason for why these heroes are fused together — and who else besides them have been fused — is currently unclear, as is if the mash-up process will be reversible. CBR will have more on these Warped heroes as they continue to be revealed and Marvel discloses more details. The post Marvel Creators Tease Superhero Mash-Ups in Social Media Campaign appeared first on CBR.